The Indian tax year runs from April 1 to March 31. Total income tax is calculated in accordance with the tax rates and rules that stand o,n the first day of April of the assessment year. Income earned in a year is taxable in the next year. The year in which income is earned is known as the previous year, while the next year in which income is taxable is known as the assessment year (for more information please see our earlier article on tax deadlines). Employment income includes all amounts, either in cash or in kind, that arise from an individual’s employment. Wages, pensions, bonuses, commissions, perquisites in lieu of salary, reimbursement for personal expenses, securities or sweat equity shares, contributions to superannuation funds, etc. are all includable in employment income. 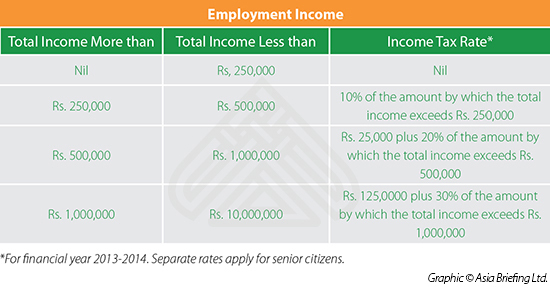 In addition, India provides that certain perquisites and allowances must also be included in employment income. Perquisites and allowances are taxed differently under Indian law. Limited deductions from income also exist. Perquisites exempt from tax are provision of medical facilities and provision of mobile phones used by the employee for business purposes. Many allowances have a small exemption amount. For example, the children’s education allowance has an exemption for up to Rs. 100 per month for up to two children. Other allowances are fully exempt as long as actual expenses are incurred by the employee. For example, reimbursement of expenses actually incurred in the performance of an individual’s employment are exempt. Many other exemptions exist for allowances, and taxpayers should consult with a chartered accountant in order to take full advantage of such exemptions. A deduction from income is available up to Rs. 150,000 for investments in life insurance, contributions to social security funds, and tuition and fees for the purpose of full-time education at a university, college or other educational institution. Non-employment income taxable in India includes long and short-term capital gains earned on the disposal of capital assets situated in India and royalties payable by an Indian concern. It should be noted that investments in shares by non-resident foreign nationals are governed by the Indian foreign direct investment policy. Long-term capital gains are taxed at a flat 20 percent. Short term capital gains are taxed at 15 percent if listed on a stock exchange in India. Royalties and interest earned from an Indian concern are taxable at 10 percent. India assesses a surcharge of 12 percent of the tax on taxpayers with income in excess of Rs. 10 million. There is also an education tax assessed at 3 percent of the tax. Foreign nationals are additionally required to contribute to the Indian social security scheme. Most expatriates worry about “double taxation” – paying taxes to two different countries on the same income. A foreign taxpayer working in India may be able to reduce taxable income in their country of primary residence (and double taxation) under a double taxation avoidance agreement. For U.S. citizens this is done using Form 1116, Foreign Tax Credit. Opportunities for tax planning exist in how employers structure wages, perquisites, and allowances. In general, it is tax favorable to have expenses reimbursed rather than given as perquisites or included in wages. However, every situation is different, and foreign nationals should consult a chartered accountant to determine the best structuring of wages and benefits for their situation.